Manila—(PHStocks)—Philippine stocks extended their growth for the fifth straight session as investors anticipate another investment grading for the country’s sovereign ratings. The mainboard Philippine Stock Exchange (PSE) index gained 0.32% or 22.43 points to close at 7,093.42 today, 2 May – reversing an early morning slide wherein investors cashed in on their gains over the previous days’ market performance. 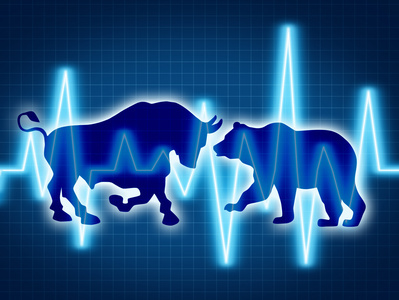 The Services index led the gaining sectors, edging higher by 1.47%, followed by the Industrials, which gained 0.52%. 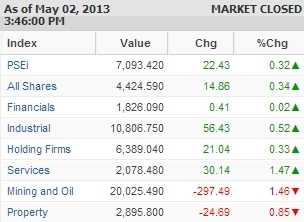 The Mining and Oil index, on the other hand, slid by 1.46%, while the Property sector dropped by 0.85%. Overall, trading was moderate. The wider All Shares index just gained 0.34% to close the day’s trading at 4,424.59. Value turnover reached PhP8.6 billion, while the volume of shares traded hit 7.54 billion. There were 103 gainers against 68 losers, while 36 stocks remained flat. A quarter of an hour after the close of the market session, Standard & Poor’s handed Philippines its second investment grade rating, citing the country’s strengthening external profile, moderating inflation, and its declining reliance on foreign currency debt. According to S&P, the stable outlook balances the policy flexibility afforded by current account surpluses and low deficits and inflation against the difficulties of alleviating the numerous structural impediments to higher growth. The most active stocks in terms of value today are SM Investments Corporation (SMIC, PSE: SM), Alliance Global Group Inc. (PSE: AGI), ABS-CBN Holdings Corporation – Phil. Deposit Receipts (PSE: ABSP), Ayala Land Inc. (PSE: ALI), and Philippine Long Distance Telephone Co. (PLDT, PSE: TEL).